Please mark your calendars for the first-ever Midwest Food Allergy Conference for Education and Science (Midwest FACES) on Saturday, June 9th and Sunday, June 10th, 2018. This conference is hosted by the Science and Outcomes of Allergy and Asthma Research Program (SOAAR) at Ann & Robert H. Lurie Children’s Hospital of Chicago and Northwestern Medicine. 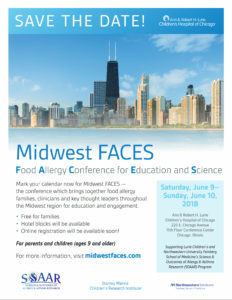 Midwest FACES will bring together food allergy families, clinicians and key thought leaders throughout the Midwest region for two action-packed days of science, education, and engagement. Families who attend this conference will hear the latest research and advancements by top clinicians and researchers in the Midwest, connect with other families and build their network of support. Additionally, at Midwest FACES, children with food allergies can find a supportive environment to connect with one another, and learn the latest research and techniques to help manage daily life with food allergies. Providing children with an opportunity to ask questions and engage with each other, clinicians, and researchers will empower them to better understand and manage their food allergy and build their network of support. The Midwest FACES conference presents the perfect platform for exchanging ideas and creating connections among all dedicated stakeholders, in addition to learning the latest and greatest in food allergy research. Exhibitor booths will also provide an interactive, engaging space to connect food-allergic families with the industry leaders, including allergen-safe food companies and advocacy organizations- just to name a few! The Midwest FACES conference is free of charge for families and travel grants are available, as our goal is to have attendance without any cost barriers. To register for the conference and access more information, including an up-to-date agenda, please visit our website at www.midwestfaces.com. I sincerely appreciate your time and consideration, and look forward to seeing your “FACES” on June 9th and 10th!